the following day, Sunday, November 4th, is the date of the annual sheepwash clean-up, just below Booth Farm, from 10.00a.m. until noon, led by Hayfield Civic Trust. Since its renovation some years ago, villagers have helped ensure the sheepwash, part of local agricultural history, is kept free of obstacles and in generally sound fettle. The work usually consists of clearing the surrounding area of the season's overgrowth, some weeding of the approach ramp, and clearing 'the wash itself' of any accumulated flotsam, the latter requiring good length wellies! Outdoor wear, and gardening gloves, are the order of the day. There's limited parking in the vicinity but lifts can be arranged. The event is not suitable for children. If you'd like to help out, or know more, contact Ann Lyon at annlyon@hotmail.co.uk. Thanks to all those of you - and your friends - who came along to Saturday's Apple Day, and helped make it the success we think it was. The weather, specifically the winds, meant we had to extemporise a good deal. We assembled twice to put up the usual marquees, but could not proceed. That meant we had to move some activities indoors. Some stallholders understandably cancelled because of fears about the integrity of their tents/gazebos/displays in the gusting winds. So we had a slightly reduced - but still good - 'offer', from that which we had planned, but probably still the equal of previous events. It was gratifying to see so many of you there and apparently enjoying yourselves. Thank you. Apple Day is a significant event for us. It provides us with some funds to do what we do through the rest of year. So it's doubly heartening when supporters turn out, in not the easiest of circumstances, to support our 'Apple Day'. The Autumn newsletter from Sustainable Hayfield is now available to download. We hope you find it of interest. This issue gives some predictable prominence to Apple Day, being held - tomorrow! At the moment, the forecast is a little damp, and breezy (but much less windy than today), and rather warm for the time of year. We hope this won't deter/will encourage you to come along, where we have probably our widest display range of attractions on offer, an almost complete A-Z of attractions and events. If you can think of attractions we might feature in future, (particularly with the missing letters! ), please let us know. As you probably know, Apple Day is Sustainable Hayfield's main source of fundraising in the year, enabling us to do what we do.....so we hope to see many of you at Apple Day, 1-4.30p.m., at the school! But the newsletter also brings you up to date with what's happening locally and more widely, of interest to our core purpose, and we hope that there's something in its pages for you! All talks will be held in Year 4 classroom. And, at Apple Day, we're delighted to announce that there will be formal notice of a launch of a new greengrocery and artisan bakery service for Hayfield! Some time ago, Sustainable Hayfield approached Village Greens, a high quality fruit and veg outlet in Charlesworth with a growing Hayfield customer base, and Grains artisan bakers in Glossop (who are often sold out by midday! ), about the prospect of them staffing, jointly, a pop up shop in Hayfield. We even suggested some possible premises. For understandable reasons, this came to nothing...but Kim and James (V. Greens and Grains respectively) have now confirmed they will be staffing a stall, outside the Packhorse, from Friday November 16th, initially 10-12.00 noon, every Friday, putting the best quality foods they prepare/serve in front of Hayfield folk. This is exciting news, and may be the beginning of the restoration of viable greengrocery and bakery presences in Hayfield. We hope you'll support the new initiative: it's what many have been calling for for some time. Village Greens are present at Apple Day, indoors, and should be able to give you more details if you wish. We hope to see you at Apple Day, and that you'll be able to support this new venture. 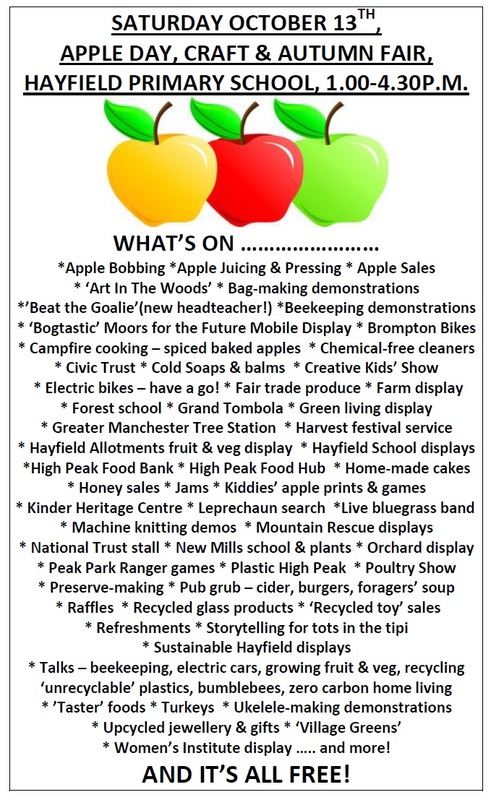 The next two weekends see some notable events in Hayfield, nigh-on guaranteed to attract the interest of Sustainable Hayfield's supporters. First, on Sunday, October 7th, the DCC Countryside Service is hosting its annual Hayfield Woodland Festival around the Ranger Station at the end of the Sett Valley Trail from 10-4.00p.m. This offers a good opportunity to find out about woodland crafts, such as pole lathe turning, hedgelaying and bushcraft skills, though watching exhibitors at work and, maybe, trying your own hand at some. There's tasty, campfire-cooked food too, and children's activities. A poster for the event is attached. the presence of the 'Bogtastic' mobile display unit, 8 metres long, commemorating the mysterious and compelling world of blanket bog, such as is being restored on the fells around Hayfield, where drinking water is cleaned, water is stored to reduce flooding, carbon builds up to tackle climate change and bizarre plants and unique animals live. There's a lot more we could - and no doubt will - highlight, but the attached poster, and a picture of the Bogtastic display unit, will help whet your appetite, we hope. We look forward to seeing you there!